Anterior lumbar interbody fusion (ALIF) is a spine surgery that involves approaching the spine from the front of the body to remove disc or bone material from in between two adjacent lumbar vertebrae. The procedure may be performed either as an open surgery or using minimally invasive techniques. Anterior lumbar interbody fusion (ALIF) is a spine surgery that involves approaching the spine from the front (anterior) of the body to remove all or part of a herniated disc from in between two adjacent vertebrae (interbody) in the lower back (lumbar spine), then fusing, or joining together, the vertebrae on either side of the remaining disc space using bone graft or bone graft substitute. 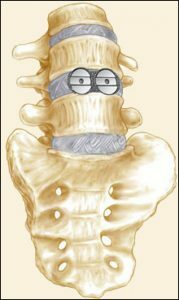 The graft material acts as a binding medium and also helps maintain normal disc height – as the body heals, the vertebral bone and bone graft eventually grow together and stabilize the spine. Instrumentation, such as rods, screws, plates, cages, hooks and wire also may be used to create an “internal cast” to support the vertebral structure during the healing process. Depending on your condition and your surgeon’s training, experience and preferred methodology, an ALIF may be done alone or in conjunction with another spinal fusion approach. Please discuss your fusion approach options thoroughly with your doctor, and rely on his or her judgment about which is most appropriate for your particular condition. Patients with low back and/or leg pain due to degenerative disc disease, spondylolysis/spondylolisthesis, scoliosis, or other spinal instability that have not responded to non-surgical treatment measures (rest, physical therapy or medications) may be suitable candidates for an ALIF. Patients without an excessive amount of spinal instability or slippage, and who have little to no spinal stenosis or nerve compression in the back of the spine, are generally the best candidates for an ALIF alone. However, ALIF as a stand-alone technique is usually not recommended for people whose bones have become very soft due to osteoporosis, or in patients with instability or arthritis. 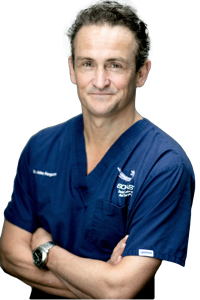 Your surgeon will take a number of factors into consideration before recommending an ALIF, including the condition to be treated, your age, health and lifestyle and your anticipated level of activity following surgery. Please discuss this treatment option thoroughly with your spinal care provider. How Is An ALIF Performed? 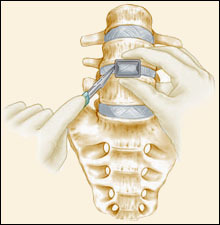 Surgeons typically perform an ALIF as a traditional, open procedure as described above; however, another option is to access the spine using minimally invasive (endoscopic) technologies that allow surgeons to reach the affected vertebrae through small incisions and intramuscular tunnels created to accommodate special guidance, illumination and surgical tools. The recovery period for a spinal fusion procedure such as an ALIF will vary, depending on the procedure and your body’s ability to heal and firmly fuse the vertebrae together. One advantage of an ALIF is that the back muscles and nerves are undisturbed. The length of time you will be off work will depend on a number of factors: your particular procedure and the physician’s approach to your spine, the size of your incision, and whether or not you experienced any significant tissue damage or complications. Another consideration is the type of work you plan to return to. Typically, you can expect to be on medical leave for 3 to 6 weeks; however, many innovations and advancements have been developed in the last few years that allow for improved fusion rates, shorter hospital stays and a more active and rapid recovery period. Please consult your physician for a complete list of indications, warnings, precautions, adverse effects, clinical results and other important medical information that pertains to the ALIF procedure. The ALIF is one of my specialties. It is a fairly straight forward procedure that has been in use for 60 years. It has especially gained prominence since the 90s when new materials greatly enhanced its success rate. 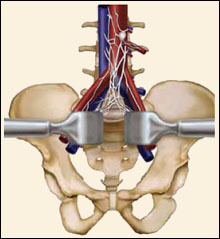 An anterior lumbar interbody fusion surgery is performed from the anterior (front). Like other types of fusion surgery, its purpose is to stop the motion at the painful segment of your spine. An ALIF is performed in your lumbar spine (lower back). Occasionally,if we determine that the patient needs additional support, we will combine the ALIF with a posterior (back) approach. Typically, an ALIF is performed to treat symptoms from lumbar degenerative disc disease. This is a syndrome in which age-related wear and tear on a spinal disc causes low back pain. If you would like to book a consultation to discuss an ALIF then please click on the contact link to discuss your issue.